Harmony Timber Solutions are delighted to work with Durkan Residential on the largest Passive Site in Ireland, Silken Park Development. 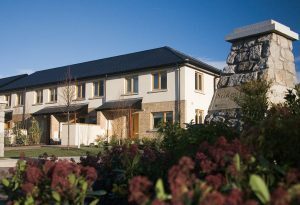 Durkan Residential planned and designed the Silken Park Development to meet the requirements of the modern demands in comfort and energy efficiency from a home. The Silken Park Development has achieved and is a certified ‘Passive House’ standard. Silken Park is the largest Passive site in Ireland, to date, and Harmony Timber Solutions are proud to be suppliers. The Passive House international certification guarantees that the development is airtight, super-efficient and maintains regular levels of heat and ventilation for a healthier living environment. For the modern home owner this means that energy bills will be significantly reduced. The Silken Park Development is located in a sought after prime location in South Dublin. The surrounding backdrop and infrastructure is in high demand and with the combination of location and high specification the development stands at the forefront of modern building. Harmony Timber Solutions intervention comes from Durkan Residential’s Design Team opting for our Open Metal Web Joists (Posi Joists) and our Timber Roof Trusses. By opting to use our Posi Joists, Durkan Residential had the flexibility to locate their mechanical and electrical requirement without compromising on the flooring structure. Our roof truss team worked closely to provide an engineered roof structure to suit the solution towards reducing the cold bridging at various junctions. Although Timber Frame was not required for this development it is suited to this style of construction. We have many solutions to assist with achieving Passive House standards whilst still selecting a Timber Frame structure. Harmony Timber Solutions are delighted to be associated with this milestone achievement of the largest Passive Certified Development in Ireland. We are also looking forward to further opportunities to assist clients with their Passive House projects.